FOUNTAIN HILLS — Maria Torres sat in her daughter’s living room remembering the day Hurricane Maria made landfall in her town of Yabucoa, Puerto Rico, and changed her life forever. Maria recalled waking up in the morning to go to the bathroom and found her feet covered in water after her entire home had flooded. She called out to her daughter, Gladys, for help, but they couldn’t open the doors in the house to let the water out. After breaking a window to get out, they spent the rest of the day mopping. 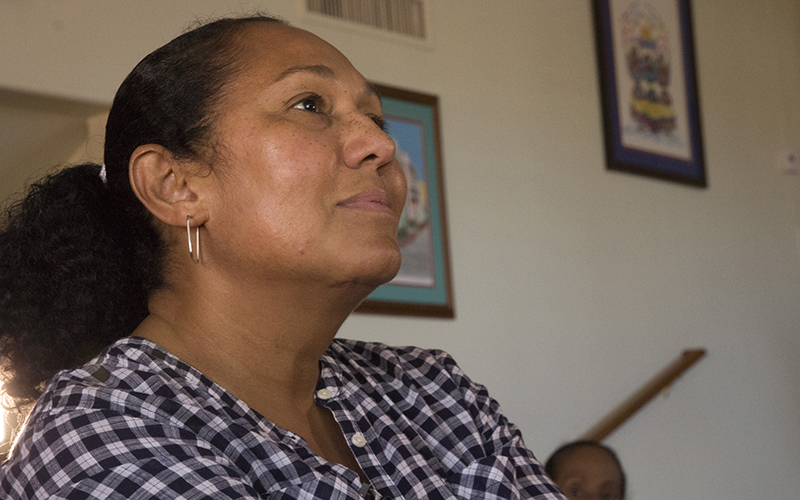 Clad in a pink cardigan and a bright pink headband with flowers, it’s clear that Hurricane Maria may have left Torres and her family with few options and scarce resources, but it has not diminished her spirit. It doesn’t take long to realize that Torres, at 81 years old, is a woman characterized by resiliency and an unmistakable sense of humor, as she refers to Hurricane Maria as a ‘tocaya,’ Spanish for someone who shares a name with someone else. Torres said she spent nearly a month without electricity, relying on flashlights and candles. 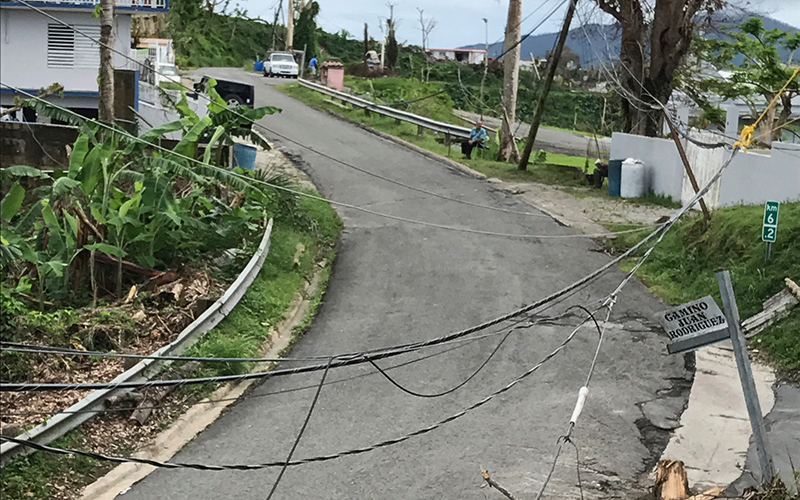 According to recent FEMA updates, as of Nov. 6, nearly 60 percent of the island continues to remain without power. Outages continue to plague Puerto Rico and establishing permanent power has been touch and go. “Oh my God, dear God, I told my husband, ‘What are we going to do now? We don’t have water, we don’t have electricity, we lost the crops that we had, what are going to do about food?’” Torres said. 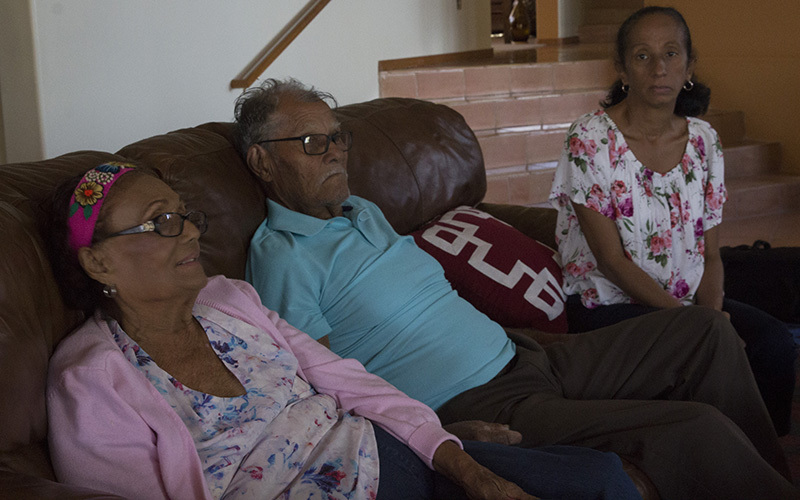 Torres, her husband Jesus and one of their daughters are three of the more than 100,000 Puerto Ricans who have left the island, according to federal government officials. However, Florida state officials put that number at more than 140,000 as more Puerto Ricans continue to arrive daily. Some of those who initially arrive in the Sunshine State end up making their way to New York, Texas, and some, like the Cruz-Torres family, end up in Arizona. In the past, Torres had repeatedly declined to visit her daughter in the Valley, but after enduring a lack of electricity and difficulties with medical conditions — her own and her 92-year-old husband’s — she finally agreed to travel back with her daughter. “I didn’t think twice about it. And now, thanks to God, I’m here, finally drinking water that satisfies my thirst,” she said. As of 2015, there were close to 45,000 Puerto Ricans living in Arizona, according to the American Community Survey, and almost 20,000 of them reside in Maricopa County. According to data from U.S. Census, there were 3.4 million Puerto Ricans living on the island in 2016, but by 2050, it’s projected the population would decrease to about 3 million due to job-related or family reasons. Now, while the island grapples with the after-effects of the hurricane, the population loss is expected to have a significant bump. 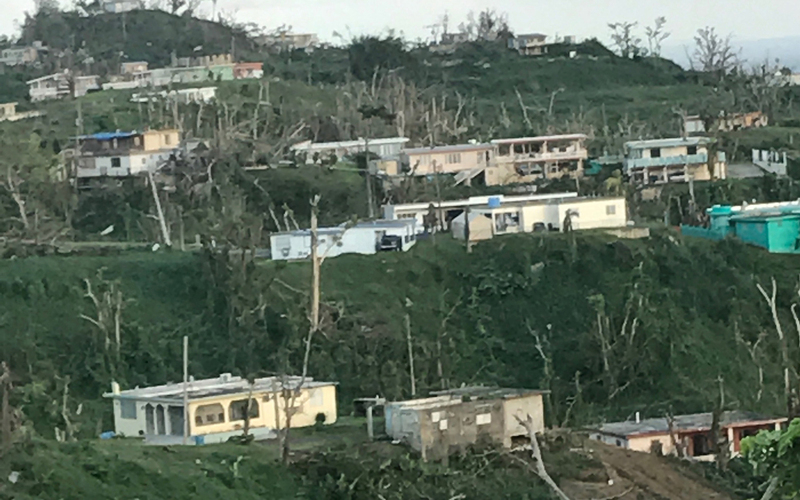 Cristalis Capielo, an expert on Puerto Rican migration and psychology, expects the population loss to increase as the island struggles to repair infrastructure while dealing with few funds. 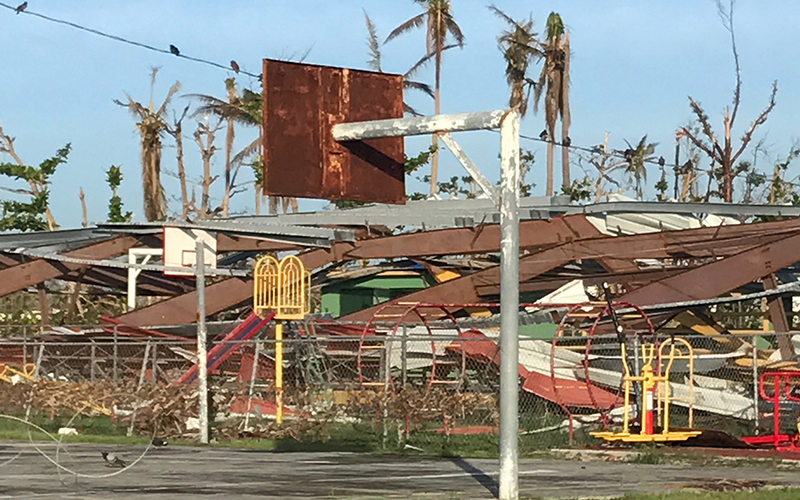 Maria Cruz-Torres, Maria and Jesus’ daughter who is a professor at Arizona State University, said the days after the hurricane were filled with feelings of helplessness as she waited to hear from her parents and siblings on the island. “It was very difficult because of the communication. I had been able to talk to them the day before, and I remember I was talking to them and suddenly the call was dropped,” she said. At that point, she was ready to hop on a plane but was unable to book a flight until Oct. 25. It took almost two weeks before she was able to hear her parents’ voices again and speak to them about everything that had happened. Cruz-Torres flipped through pictures on her phone showing the destroyed landscape of her parents’ hometown. Puerto Rico, which is known for its lush green landscape, was in many places left with leafless and broken trees. She looked through pictures she took back in June of this year, when she had visited Puerto Rico, and compared the two, saying she was glad she was able to see her country before it was ravaged by Maria. What does Torres miss the most? “I miss the ocean, being able to see the ocean from my home, and my plants as well,” she said. While she said she’s happy and grateful to be in Arizona, Torres also couldn’t deny she misses the rest of her family. For now, Torres’ plans, along with her husband’s and daughter’s, are to remain in Arizona until running water and electricity are restored to their home, which they hope is by December. Despite dealing with the trauma of going through a hurricane, and having to relocate Torres maintains that positive spirit she’s known for.